"Nicephorus I" redirects here. For other uses, see Nicephorus I (disambiguation). Nikephoros I, or Nicephorus I (Greek: Νικηφόρος Α΄, Nikēphoros I; died July 26, 811), was Byzantine Emperor from 802 to 811, when he was killed in the Battle of Pliska. Prior to his accession, he had served as genikos logothetēs, whence he is sometimes surnamed "the Logothete" (ὁ Λογοθέτης) and "Genikos" or "Genicus" (ὁ Γενικός). Both Syriac sources such as Michael the Syrian and Arabic ones like al-Tabari and Mas'udi hold that the emperor was of a Ghassanid Arab origin. Byzantine chronicles, however, although generally hostile to him, make no explicit mention about his ethnic background. On the other hand, al-Tabari claims that he learned of Nikephoros' Arab origins from Byzantine sources. Some scholars, like Paul Julius Alexander, accept al-Tabari's account, citing a Byzantine apocalyptic text in which the emperor is said to be "from the race of Gopsin". The word "Gospin" could be a Greek rendering of the name "Ghassan", or the name "Gafna", the eponym of the Ghassanids. The Byzantine Empire at the beginning of the reign of Nikephoros I, in 802 AD. A patrician from Seleucia Sidera, Nikephoros was appointed finance minister (logothetēs tou genikou) by the Empress Irene. With the help of the patricians and eunuchs he contrived to dethrone and exile Irene, and to be chosen as Emperor in her stead on October 31, 802. He crowned his son Staurakios co-emperor in 803. His rule was endangered by Bardanes Tourkos, one of his ablest generals, who revolted and received support from other commanders, notably the later emperors Leo V the Armenian and Michael II the Amorian in 803. But Nikephoros gained over the latter two, and by inducing the rebel army to disperse achieved the submission of Bardanes, who was blinded and relegated to a monastery. A conspiracy headed by the patrician Arsaber had a similar issue. Nikephoros embarked on a general reorganization of the Roman Empire, creating new themes in the Balkans (where he initiated the re-Hellenization by resettling Greeks from Anatolia) and strengthening the frontiers. Needing large sums to increase his military forces, he set himself with great energy to increase the Empire's revenue. By his rigorous tax imposts he alienated the favour of his subjects, and especially of the clergy, whom he otherwise sought to control firmly. Although he appointed an iconodule, Nikephoros as patriarch, Emperor Nikephoros was portrayed as a villain by ecclesiastical historians like Theophanes the Confessor. Khan Krum feasts while a servant brings the skull of Nikephoros I fashioned into a drinking cup. 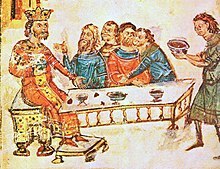 In 803 Nikephoros concluded a treaty, called the "Pax Nicephori", with Charlemagne, but refused to recognize the latter's imperial dignity. Relations deteriorated and led to a war over Venice in 806–810. In the process Nikephoros had quelled a Venetian rebellion in 807, but suffered extensive losses to the Franks. The conflict was resolved only after Nikephoros' death, and Venice, Istria, the Dalmatian coast and South Italy were assigned to the East, while Rome, Ravenna and the Pentapolis were included in the Western realm. By withholding the tribute which Irene had agreed to pay to the caliph Hārūn al-Rashīd, Nikephoros committed himself to a war against the Arabs. Compelled by Bardanes' disloyalty to take the field himself, he sustained a severe defeat at the Battle of Krasos in Phrygia (805). In 806 a Muslim army of 135,000 men invaded the Empire. Unable to counter the Muslim numbers, Nikephoros agreed to make peace on condition of paying 50,000 nomismata immediately and a yearly tribute of 30,000 nomismata. With a succession struggle enveloping the caliphate on the death of Hārūn al-Rashīd in 809, Nikephoros was free to deal with Krum, Khan of Bulgaria, who was harassing his northern frontiers and had just conquered Serdica (Sofia). In 811 Nikephoros invaded Bulgaria, defeated Krum twice, and sacked the Bulgarian capital Pliska. The Chronicle of 12th-century patriarch of the Syrian Jacobites, Michael the Syrian, describes the brutalities and atrocities of Nikephoros: "Nikephoros, emperor of the Byzantine empire, walked into the Bulgarians' land: he was victorious and killed great number of them. He reached their capital, seized it and devastated it. His savagery went to the point that he ordered to bring their small children, got them tied down on earth and made thresh grain stones to smash them." During Nikephoros' retreat, the imperial army was ambushed and destroyed in Varbishki mountain passes on July 26 by Krum. Nikephoros was captured during the battle and sent to Pliska, where Krum ordered his decapitation. Krum is said to have made a drinking-cup of Nikephoros' skull. Staurakios, who succeeded as emperor. Prokopia, who married Michael I Rangabe, emperor 811–813. ^ a b Bekkum, Wout Jac van; Drijvers, Jan Willem; Klugkist, Alexander Cornelis (2007). Syriac Polemics: Studies in Honour of Gerrit Jan Reinink. Peeters Publishers. p. 97. ISBN 9789042919730. ^ Cooper, Eric; Decker, Michael J. (2012). Life and Society in Byzantine Cappadocia. Springer. p. 42. ISBN 9781137029645. ^ Biliarsky, Ivan (2013). The Tale of the Prophet Isaiah: The Destiny and Meanings of an Apocryphal Text. BRILL. p. 208. ISBN 9789004254381. ^ Alexander, Paul Julius (1985). The Byzantine Apocalyptic Tradition. University of California Press. p. 66. ISBN 9780520049987. ^ Alexander, Paul Julius (1985). The Byzantine Apocalyptic Tradition. University of California Press. p. 66 (note 21). ISBN 9780520049987. ^ Shahîd, Irfan (1995). Byzantium and the Arabs in the Sixth Century. Harvard University Press. p. 150. ISBN 9780884023470. ^ a b Mikaberidze 2011, p. 222. Mikaberidze, Alexander, ed. (2011). Conflict and Conquest in the Islamic World: A Historical Encyclopedia. Vol. 1. ABC-CLIO. This page was last edited on 18 December 2018, at 22:46 (UTC).